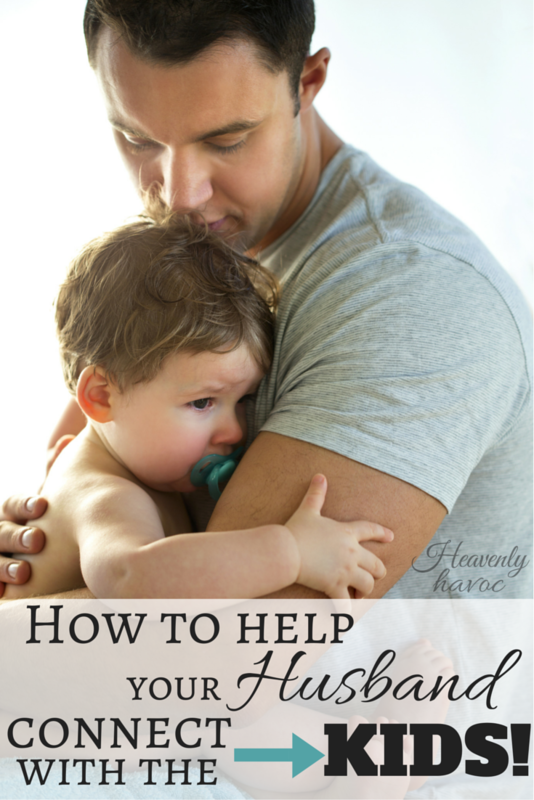 Do you feel overwhelmed and wish your husband would help out more with the kids? I’m pretty sure EVERY mother can relate at some time or another. How do you help your husband connect with the kids and help out more? I think as mothers we sometimes take for granted how easily we bond with our babies after birth. It JUST HAPPENS! We then feed that baby, clothe and bathe that baby, and take care of it each and every day. In reality, it’s like our children take a piece of our hearts and walk around outside of our bodies! Moms need breaks though, and although it’s a precious thing to have a bond with my kids and know that they will always come to me….sometimes I need a BREAK! That’s when my husband kicks in! My kids naturally come to me for everything, though, so it takes a little work to get them to connect with DAD and build a relationship with him so that I can steal a few minutes to myself. Here are a few “tricks” I’ve learned to help my husband build relationships with our kids. Hand over that newborn as much as possible! Even if your husband is leery about helping, encourage him to change diapers, help with feedings, and hold the baby as much as possible. The more time a person spends serving another, the more they come to love that person. The same applies with dads and babies. Don’t try to be a super mom! Allow your husband to help as much as possible. My husband refused to hold anyone’s baby before we had our own. He was just too afraid he would drop them or do something wrong. After we had our first, I was pleasantly surprised at how quickly he bonded with our daughter. Back your husband up! How do you talk about your husband to your children? I know it can be easy to air frustrations aloud about how dad is “failing” or not doing the things you want him to. I know, because I’ve done it. I learned this lesson the hard way! Soon, I noticed my kids also belittling my husband when he was gone and then I noticed a loss of respect. Since then, I have always tried to back him up in everything and be a team. The golden rule applies here big time. Talk about your husband the way you would want him to talk about you when you’re not around! Encourage “rough housing.” Kids need time to be crazy. It may be hard to watch your kids get all wound up right before bed but this is another way for kids to bond with dad. So if your husband has suddenly become the horse that all your kids are riding, or the human jungle gym, just smile and remember that kids grow up. You might even get a few moments to yourself while he entertains the minions! Be a role model. I have also learned this one the hard way. My husband grew up as the youngest child so he never had the opportunity to help out with younger siblings. Being a father and taking care of a human being was all new to him! I was the oldest of eight but was still completely unprepared for what motherhood would bring. My husband has just kind of followed my lead in how to take care of our children. Sometimes that has been a good thing, sometimes not as much when I’m cranky or inconsistent. Either way, we have learned together along the way. My husband has an enormous amount of patience, where I am always struggling in that area. Learn to forgive. The more we complain about our spouses, the more of a wedge we create in our marriage and with our kids. I am so thankful that my husband has put up with all my weaknesses and imperfections the past 14 years. The fact that he still stands by me tells me I picked a GOOD ONE!